8" x 10" framed print, double matted with gold frame. 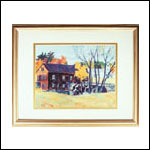 Available with any one of eight images by Massachusetts artist Louise Minks. Photo above shows "Cape Cod Ocean Sunset" print.